French director Benoît Jacquot began working with legendary writer Marguerite Duras in the 1970s. He’s known for his work bringing a particular sensitivity to women’s roles and bringing out the best in his actresses, often helping launch them into international renown. Never Ever begins with an amour fou, an impetuous love affair between Rey (Mathieu Amalric), a self-centered film director, and Laura (Julia Roy), a performance artist. They meet cute at an art center in Portugal, where he leaves a screening of one of his films and runs across her in an upstairs gallery, where she’s performing an abstract piece. Their eyes meet and a grand affair begins. Rey, whose reckless desire complements a general recklessness in his life that is ultimately self-destructive, brings Laura to his seaside villa and then, crashes his motorcycle. Laura must pick up the pieces, and after a short time, she seems to be going mad. 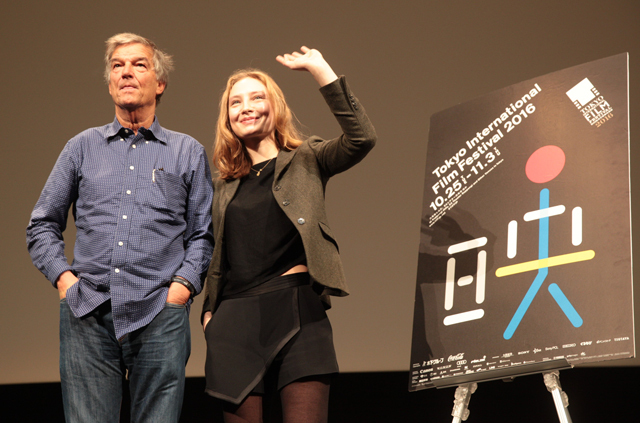 Benoît Jacquot and writer-star Roy came to Tokyo for the October 30 screening of their film in TIFF’s World Focus section, and spoke at a Q&A session afterward. However, he did reveal one small tidbit of his strategy. “At the beginning of the film, when Rey and Laura meet, I put her in black so that her dress and the black background blended together, and her white face and hands stand out to give a strong impression.” And he offered a simple and somewhat unexpected explanation of Laura’s wardrobe, saying, “The character of Laura is always dressed in black, because Julia in real life normally wears black. The question came up about how personal experience might influence performance art. The denouement of the film shows Laura doing a performance before a rapt audience, touching on the points of her own recent experiences. It was unclear, perhaps, whether her seeming madness had been just her way of developing a performance art piece.